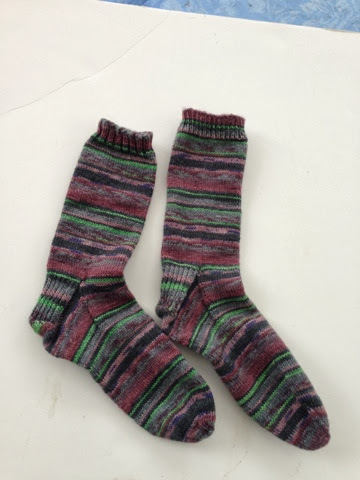 This toe-up sock technique just doesn't come easily to me! 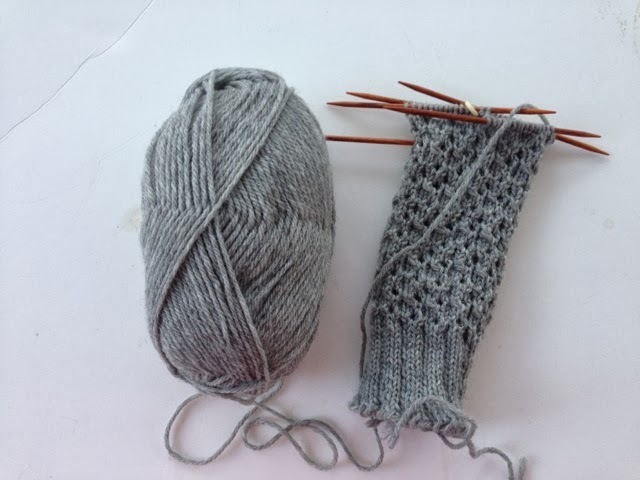 As you can see, I've frogged out quite a lot, including the heal flap and heel turn. There were just too many mistakes. I kept making dumb mistakes in the easy lace section. And my heel turn wasn't centered. I promised myself I would get it restarted this weekend, but I'm not sure that will happen. I am just exhausted. This year, my district scheduled spring break for mid-April, meaning that we have 14 solid weeks of school between the winter and spring breaks. It's just too long! The kids always get squirrely before spring break, but this year the teachers seem to be struggling even more than the kids. I almost hate to say that because I know that from the outside, it looks like teachers get plenty of breaks. The flip side is that our work has an intensity that few jobs have. And I don't think many people would argue that 8th-graders are an especially demanding bunch. Still, they are at a fascinating age and they make me smile. This is embarrassing: I started this pair of socks in 2010. Yes, 2010! They are my first -- and only (so far, at least) -- attempt at toe-up socks, the Diagonal Lace pattern from Wendy Johnson's first book, Socks from the Toe Up. 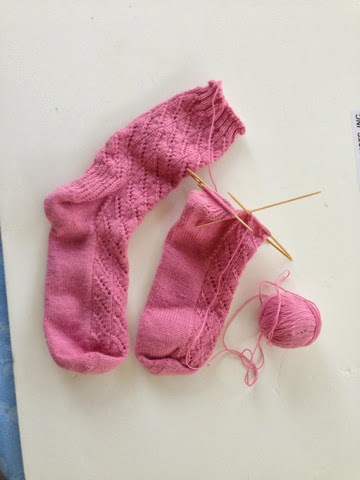 If you knit toe-up, you can see that I got stuck while making the gusset. I pulled these socks out this weekend and sat down with Wendy's book. Strangely, the mistakes that had inspired me to abandon the project were in the lace, which is pretty simple. I ripped back a few rows and got going again. I think I'm actually going to finish this sock! 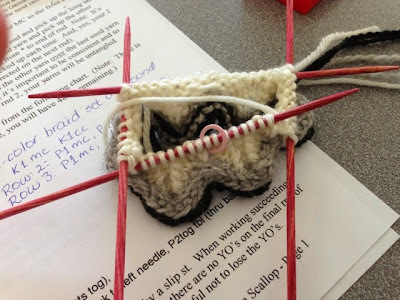 See what other knitters are working on with Tami Amis. Les Cables Des Faux is a free pattern from Needle Addict. As the title implies, it's a faux-cable pattern. Very easy and well written pattern. I did make some adjustments: I wanted my tighter and less slouchy that the originals, so I subtracted one pattern repeat and cut a couple inches off the length. I love the way they came out. Confession: These are filled with mistakes -- missed yarn-overs. I decided that the mistakes wouldn't be noticeable and didn't frog. I think I made the right decision. 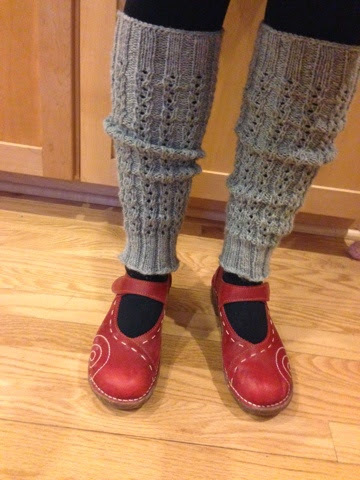 When I wore them to work the other day, I asked my knitting pals to find the mistakes; they couldn't. However, if these had been intended to be a gift, I would have frogged and re-knit. The yarn is Plymouth Galway in a heathery gray. I love it when an affordable yarn makes a great project. If I make these again, I'd use the same yarn. The sad part: It was cold and snowy enough here on Wednesday to wear them! Check out the other FOs with Tami Amis. I cast this on over the weekend (clearly in a state of denial about my many WIPs). 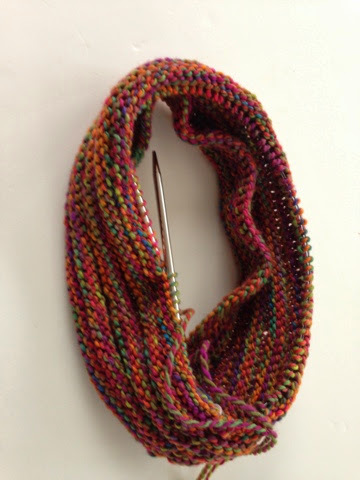 It's the Present cowl, a free pattern whose simplicity is perfect to show off beautiful yarn. 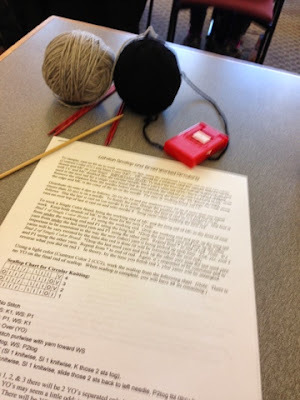 Nothing but knitting and purling in the round. The yarn is gorgeous. Unfortunately, I can't find the ball band, though if I had to guess, I'd say it's a Mountain Colors yarn. In this photo it has an orange cast; in the wool, though, it's more pink. It really was the perfect thing for finishing the last season of Breaking Bad. Check out other WIPs with Tami Amis. 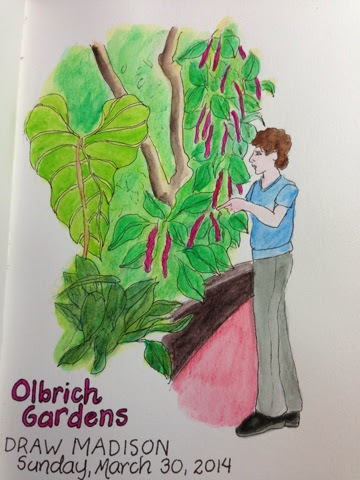 I had forgotten how invigorating it is to take a really good class. Mary Germain taught the class. A former owner of a yarn store in Milwaukee, Wis., she has become an expert on Latvian knitting. 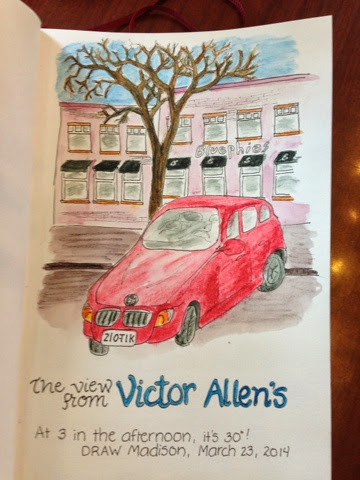 She traveled there in 2001 and then went to Estonia in 2003. She has self-published a some books with her friend Sandy De Master. Mary explained the process very thoroughly and provided written instructions. I highly recommend taking a class with her if you have the opportunity! Now I have to find a pattern that I like that has a Latvian Braid. I know there are a lot of patterns out there, but I need to find one that is not too daunting. The marketplace was smaller than usual, but the quality was awesome .... but that's another post! I picked up these three skeins of yarn today and I have to get them swifted (is that even a verb?) today. Because tomorrow I am taking a class at the Madison Knitting Guild's annual Knit-In: Latvian Scallop and Braid. 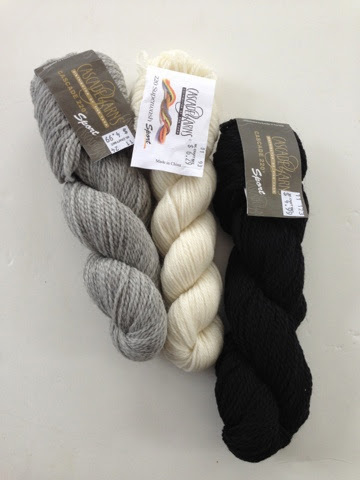 It's hard to believe that my huge stash did not contain three coordinating colors of sport-weight yarn for the class. But it didn't! The LYS was really busy, which makes sense. I'm sure the two-day Knit-In draws a lot of out-of-towners. 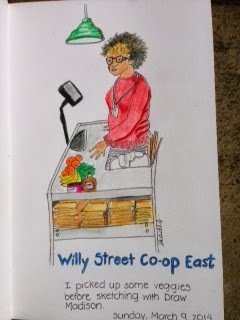 I was happy to see the crowd was shopping locally. My class is from 9 to noon, and I have afternoon plans. This crowded schedule will keep me from spending too much at the Knit-In marketplace, which I'm sure will be full of temptations! This is actually the second in a pair of leg warmers. I raced through the first one. Les Cables de Faux is an easy pattern and I knew I'd have lots of opportunities to wear leg warmers. Leg warmers, like scarves, can feel endless, though. Once I started the second one, my mojo evaporated and the whole project sat around for for a couple months. Maybe I would have been more motivated had I known exactly how long and cold this winter was going to be. I came across it when I was whipping through my pre-wedding cleaning. At that point, I had only done the cuff and a few rows of the pattern. 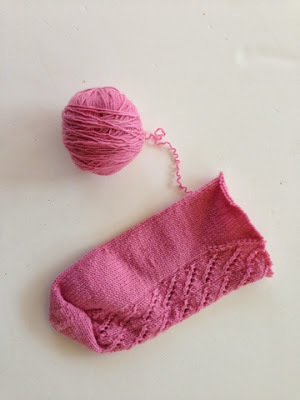 I would like to be able to have this one wrapped up -- I don't see myself wanting to knit legwarmers in July -- but I'm really struggling to stay focused on it! Are there any projects you've really had to push yourself to finish? Don't forget to see more WIPs at Tami Amis' blog. Can you see why this isn't the FO I was expecting? 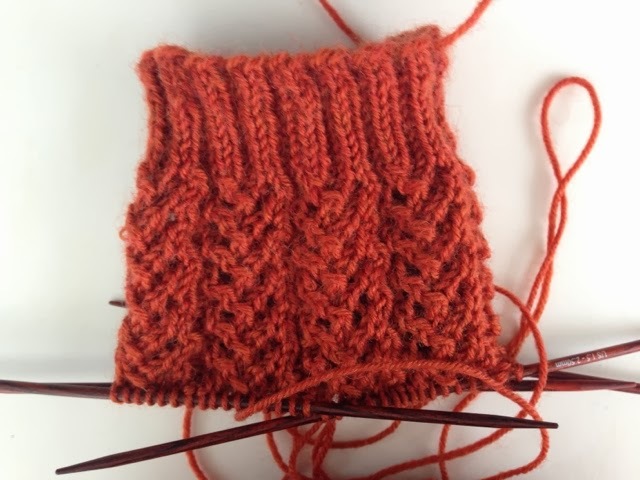 I bet you spotted the problem immediately: I used a 1-by-1 ribbing for the cuff on on one sock and 2-by-2 ribbing on the other. These are intended as a gift, but I can't see presenting them as a pair. I could keep them for myself, but they aren't my colors. The only satisfactory solution I could come up with is to buy a second skein of the yarn and knit another mis-matched pair. Though these aren't colors I wear, I do like them -- and that's a good thing since I'll be spending quite a bit more time with them! I am calling it Autumn Trellis. I have the "designed" in quotation marks because this is really just a variation on the basic top-down sock pattern. I don't remember where I found the stitch pattern, but I changed it a little bit so it's kind of original. I don't envision myself as a knitting designer, but it's kind of fun to do something semi-original. Don't forget to check out other WIPs with Tami Amis! Yep, we've made it official. Keith and I got married over the weekend! After 11 years, we're pretty sure this relationship is going to work out. 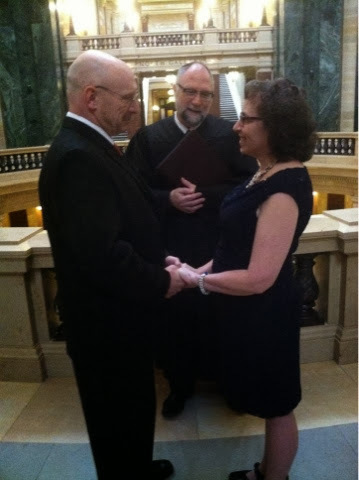 We had a very simple ceremony at the state Capitol on Friday, followed by dinner at a tapas restaurant for immediate family. On Saturday, we had a dessert reception with family and friends. The weekend went exactly as I had hoped: very casual and relaxed. I had a "big white" wedding the first time around and, well, clearly a big wedding does not guarantee a long marriage. This celebration was just right. The moments when Keith and I exchanged vows stand out as the most important part of the weekend. When he said his vows to me, I knew that he meant every word. As did I when I repeated them back. Celebrating with family and friends and very little fuss was just right for Keith and me. The feeling of celebration was enhanced by news we had had received in the weeks before the wedding: Both my children have been accepted into graduate programs. Seth will be attending veterinary school here in Madison; Rachel is deciding between two criminology programs in Florida. For all of us, life has its bleak passages. It's important to savor the good times.